Bonjour Scrap ! : Can I have some glitter with this Christmas ? Last year, I bought this cute die set with trees by Little B and I'm glad I can put it in use this year too ! I was a perfect fit in the center of the kraft journaling tag. 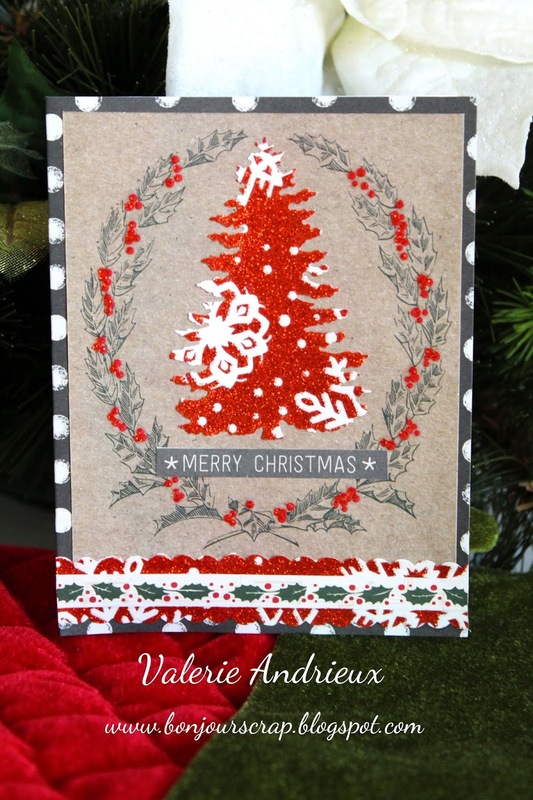 I add a cut sentiment , a border with holly, and a red glitter border cut with decorative scissors. You don't have glitter paper ? You can add sparkle some with glitter glue... It's the freebie of the day at scrapbook.com ! A Ranger Ink Stickles Glitter Glue Frozen ! And that is along the sale of 12 Hot Brands (Ranger, Sizzix, Prima, American Crafts... and more) at 20 to 50% off and for the last day only 20 to 50% off Tim Holtz products too ! I wish you a great starting week, and will see you tomorrow for another card ! And don't forget to comment this post to enter my giveaway !